Working on a quilt top is one of my favorite aspects of any quilt. I love the motion of cutting the first few pieces and getting a glimpse of what the project will turn out to be. When I initially began thinking about making a sewing/craft space, one of my main objectives was to have a comfortable and permanent productivity station. 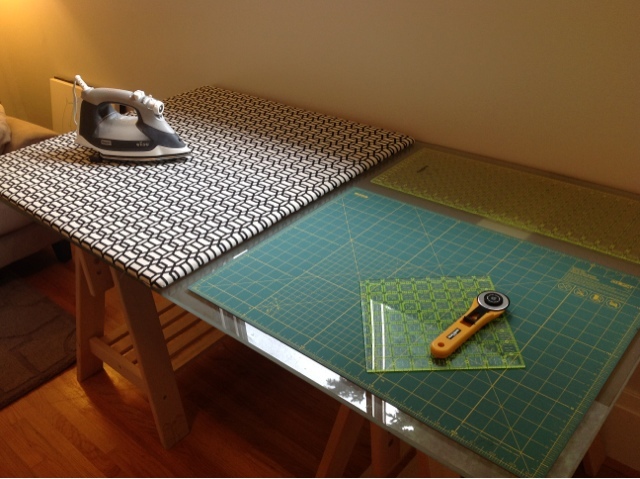 About a month ago I gave you the first glimpse of this table when I posted a table top ironing board tutorial. My intention with this table was to create some permanent space to both cut and iron on while I work on a project. Lucky for me, my brother was getting rid of this ikea desk and I knew right away it would be perfect for the task at hand. The best part about this table is that the saw horse legs are height adjustable using wooden dowels, so the table can be lifted to accomodate my tall figure. Cutting can be extremely painful on my back if have to slouch over a short table top, so this works wonders for me. Realistically, this productivity table has become more of a productivity wall. Early on in my planning process, I knew I didn't want a heavy desk against this wall, but I still needed some storage. This desk works well for me as I have clutter free storage on both sides. On the left hand side of the desk, I have a wooden notion tackle box that was handmade by my father-in-law. I have been oohing and ahhing over antique sewing boxes on ebay for years and he definitely took note last christmas when he gifted me with this. I currently hold my more used notions in this tackle box, including spools of thread and my gingher scissor collection. To the right of the notion box, I have two wicker baskets placed on the saw horse base. One basket holds marking notions, a tape measure and a jar of pins. The second basket is used to collect scraps when I'm cutting on the table top. In the right hand saw horse leg, I store my Janome so it can be accessed quickly when I need it. A well placed screw in the wall holds my rulers when they aren't in use, and a closet knobs holds my current favorite tote for when I'm out and about. In the photo above you get a closer view of my new craft room drapes. I used a combination of two Anna Maria Horner prints from LouLouThi along with some Kona Coal to add some visual weight on the bottom third. It was a pretty strong fabric choice and I have to admit I was a bit worried at first, but once I hung them I felt nothing but inspired. I think they made the perfect addition. In the back left corner of this final picture you can barely make out a folding table. Currently I pull this table out and set it up against the far wall when I sew with my Janome. It shakes a bit if I force the pedal, but for now I'm enjoying the flexibility it gives me to open the space up when I need it. Perhaps in the future I'll find a better long term solution. I am also on the hunt for some half decent track lighting to help bring some light into the space. The dome shade we have right now isn't cutting it for late night sewing fests and as fall and winter approach, I see more of those in my future. beautiful curtains. :) and i love your desk, esp the pressing half. i am trying to figure out how i want to do pressing in my new space, so this gives me some ideas. thank you!